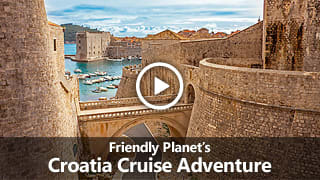 Already booked on one of our packages to Croatia? See everything you need to know before you go. According to the World Health Organization, immunizations are NOT currently required for travel to Croatia. However, you may wish to consult your personal physician or local public health authorities regarding other recommendations. The warmest and driest months are May through October with average daytime temperatures in the 70’s and 80’s. Evening temperatures will be about 15-30 degrees cooler. Winters are usually cold, snowy, and drizzly. We recommend that you bring along a sweater for the evenings, even in the summer. Since weather can be unpredictable and to be sure you are comfortable during your trip and prepared for all types of weather possibilities, we suggest that you carry a small folding umbrella and take with you a light jacket or sweater. If you have two pairs of comfortable (broken in, not brand new) walking shoes, by all means, take both pairs. Packing to dress in layers is a great way to prepare for a variety of weather conditions. Finally, remember that comfort and convenience should dictate your wardrobe for the tour, and casual clothes are in order for most every occasion as you travel. The official currency in Croatia is the Kuna. The hotels, some stores and some restaurants will be able to accept major credit cards. However, smaller stores, souvenir places and some art galleries will accept cash only in local currency, Euro or US dollars. ATMs are available in most major cities. We highly recommend that you bring enough cash to cover incidental expenses as well as tips to the guides and drivers. We recommend that you bring crisp, new bills because old, torn, or crumpled bills are often not accepted. Travelers’ checks are no longer widely accepted. If you intend to use traveler’s checks, please be sure to verify that they are still accepted in the places visited on this tour. In Croatia, shop for olive oil, wine, truffles and various gourmet delicacies, lavender, filigree jewelry, lace from the islands of Pug or Vis, and arts and crafts. Check out our blog for our latest articles on Croatia.